Sucker Punch � An unexpected punch. Oh, that was deep, and I know what you�re thinking, what the hell does that have to do with anything. Well firstly, your mom, secondly, the lack of new things in Lineage. Sometimes we may wonder if something new will ever happen. Fear not my friends, something new has happened. Well, it isn�t quite so new because I like totally slacked off you know? Anyway, this new thing has been waiting, been shining itself up so it really sparkles. And yet somehow, it doubled. Woo, two paragraphs in and you still have no idea what I�m writing about. Now, I�m going to tell you, I�m writing about the one, the only, the amazing Chrystopher and his frumpy sidekick SilverSlicer, the only level 52 elves on Depardieu. Chrystopher has been playing for about two years taking over seven months to go from 49 to 52, gaining 4-5% a day on Forgotten Island. He has no current goal but to get to level 53. 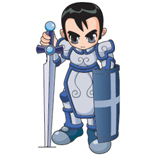 He wields a +9Yumi and has negative 6xac with no shield, and added one point to dexterity and one point to strength. This 47 year old from North Alberta, Canada got started by his son who was level 46 at the time. His son is now level 47 and going strong. He was mostly drawn to the game by his love of AD & D. Ahh, it makes me so happy when people played AD & D.
Our little buddy SilverSlicer has been playing for a year and a half taking six months to go from 49 to 52. He gains around 4% a day power leveling with one Death Knight on Forgotten Island. Usually it was Zuluuu or NYSE, but sometime Bravehearts, SwordMonkey, or Whitehand would hunt with him, even getting him as much as 6% on his last day at 51. 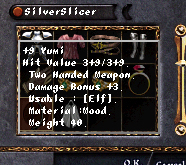 SilverSlicer has -61 ac and a +9Yumi with no shield but plans to improve that very soon. His friend KnightSnake got him started and he is only 19, old enough to be Chrystopher�s son, he jokes. Ironically he lives in San Fernando Valley, California, which is where quite a few Lineage Players seem to live. They are both members of ThaUsualSuspects blood pledge. They said they didn�t make the pledge to be strong or high level. It�s just a few good friends having fun. Even though they admit a lot of time has been spent focusing on leveling up. They both say that 49 to 50 is the very hardest part and after that it�s all uphill. After that you can hunt FI like them and get some drops that include: Death Knight Gloves or Demon Gloves, like them. They say the level 50 magic is nice but the dark elf morph makes it very worth it. On that note, Shalisha just hit level 50 and is getting married to Chrystopher very soon. Congratulations all of you and good luck. what kind of elves are they? Congrats to both of you. 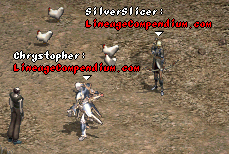 SilverSlicer, I tip my hat to you, out of all the lvl 52's, you are like the only kind one that still has both feet on the ground and realizes this is still just a game.
" Well firstly, your mom,"
Was this ment to be funny?! Congratz on both elves. gj. I thought it was TheUsualSuspectz now... Anywhoo... Again congratz to both of you!! have fun guys, blew my stuff only got junk left, well i had junk before too but anyhoo not coming back and my acc ran out. Congrats both of you, I wouldn't want to mess with elfs that strong hehe. btw dlirk wouldn't it be downhill after 50 if it got eaiser? who else lives in the valley o.O silver and i are in west hills. chrys lvled a week before silver but waited. i'll be home in a week. What do u mean Shalisha was that girl wOOtage?? passionfruit: "Gratz to the best elf in the game...and u too silver"
on a side note, I could have -10 more ac than Chrys, and 5 more lvls, he will still be a far greater player than me. he's had to work twice as hard as me to get to the same place. I sure as hell wouldn't have been able to get this far if I had as many lag/dc deaths as he did, or bad luck blowing +5 ac with bzels. u go!!! 65+ now -.-; we need some recognition in the World Lineage Scene. can u blame me for having a biased opinion tho? Didnt silver have sayha before? Whatever happened to that, traded for +9yumi? awsome awsome guys!! reallY!!! gogogogogogo!!! ^^ you guys are great!! I thought about switching to sayhas, and actually bought a few scales, feathers, and tears, but sold them. gl and have fun leveling!! Grats, hope my con elf does so well. Nice peeps too ^^ very deserving. "Tha" cuz "The" is on a different prince. So nice to see you can get to 52+ while having manners and respect for other players. Congrats guys! Three cheers for fellow "old" lineage players! now we need a level 52 con elf that strong(best char in the game hehe)...all 3 of them take on the world. keep up the good work... keep lvling! SharpArrows is 52 too now and how come he joined SolL. wasnt he a FCA? Another Californian found! We should seriously gather up Californians join force. Us who live in California are all split up. We can have this game down like other Toronto players. Well, congratulation.